I guided a heli-assisted ski trip on the SE side of Paleo Peak today. This is NW of Smithers at the head of Kitsuns Creek. There were some older avalanches to size 3. Most of those were wet and in sunny aspects, with only few and shallow slabs. Air temperatures were cooler today, with -5 at 1200 m in the morning and -2 at 2200 m at 1400 hours. There was a 6 cm crust in the valley bottom which carried skiers but not walkers until 1500 hours on an E aspect. We saw no new avalanche activity. There was minimal new snow on Friday. 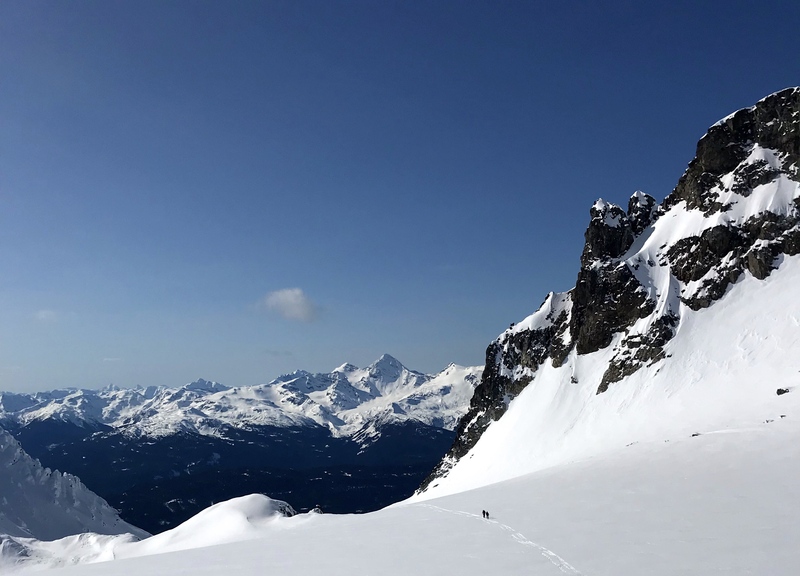 Northerly aspects have a skiable crust with a little bit of wind-blown dry snow on it at elevations above 1600 m. Sunny aspects have decent corn. Below the crust, the snowpack is dry. I probed 210 cm at the bottom of the SE glacier at 1800 m. There were some crevasses visible, but they were easily avoided. More crevasses showed on the N glacier. We climbed Coal Crag on the E side of the broad saddle between the N and S glaciers. This is straightforward step kicking.